European leader provider of workplace drinks solutions, offering a complete, one-stop service to meet every organization’s water and coffee needs. 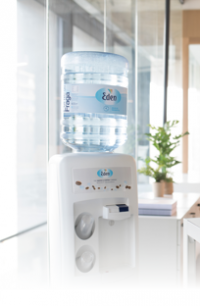 Eden has more than 2800 employees and manages a distribution network across the continent, including production facilities, a fleet of more than 1100 service vehicles and 26 local water sources. The scale of operations was achieved through a combination of business entrepreneurship, market expansion, operational excellence, and the execution of over 80 acquisitions of varying sizes since 1998. Since 2016, Eden Springs is part of Cott Corporation (NYSE:COT; TSX:BCB), a diversified beverage company with the largest volume-based national presence in the North American and European home and office bottled water delivery industry, a leader in custom coffee roasting and blending of iced tea for the U.S. foodservice industry, and one of the world’s largest producers of beverages on behalf of retailers, brand owners and distributors. Cott’s platform reaches over 2.3 million customers or delivery points across North America and Europe supported by strategically located sales and distribution facilities and fleets, as well as wholesalers and distributors. This enables the group to efficiently service residences, businesses, restaurant chains, hotels, small and large retailers, and healthcare facilities. For more information see www.cott.com.